Known for his innovative takes on Texas barbecue, Pitmaster Evan LeRoy incorporates elements of fine dining and from-scratch cooking into his menu, shining a new light on the traditional cuisine. Comfortable around a live fire from a young age, Evan’s culinary experience ranges from fine dining, at Hudson’s On the Bend, to barbecue at Hill Country Barbecue in NYC. He has traveled to Australia and Russia, to train and work with prospective pitmasters and has been known for his openness to teaching and sharing smoking secrets. 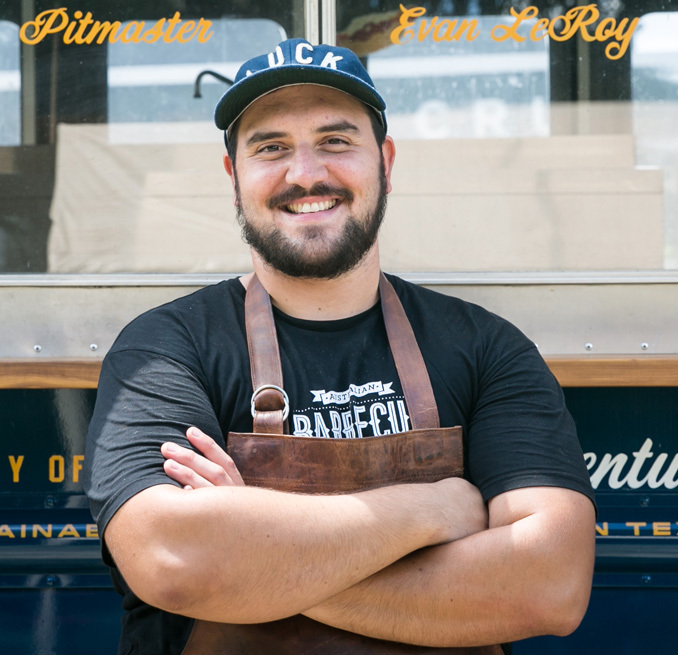 He is currently the co-owner and chef of LeRoy and Lewis, a new school barbecue truck offering locally sourced and seasonal ingredients and focusing on a mix of alternative and traditional cuts.